The report includes various details gathered on the basis of ongoing and expected dynamics. It majorly includes evaluation of the key developments taking place around the financial services and its infrastructure, defense organizations and also the introduction of new vehicles in market. All these areas involve major application of bulletproof security glass, and its assessment helps in clear outcomes of the anticipated market growth and the demand structure. The growing need of security in every sphere has marked the growth of bulletproof security glass market. It is finding its way in various applications like armoured cash truck, ATM booths, premium vehicles, banks, and others. 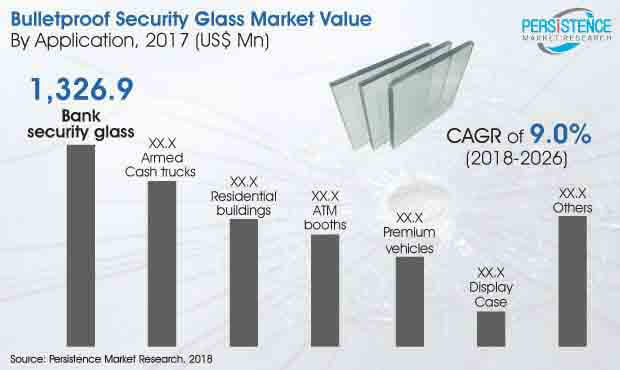 While a majority areas of developed regions demand bulletproof security glass in as many applications as possible, developing economies are also witnessing significantly growing demand following the increasing need for reliable security. According to the research report, bank security glasses is a leading application segment of the market, which is expected to reach a value of over US$ 2,000 Mn by the end of 2026. However, the future prospects are brighter for the automotive industry, as the premium vehicles market is expected to lead in terms of growth rate. The premium vehicles value in global bulletproof security glass market is anticipated to grow at a CAGR of 11.0% during the forecast period. The need to ensure maximum safety of financial institutions and reduce risks to human life is expected to drive the market across the globe. The new horizons of financial services and organizations, have improved the prospects of bulletproof glass application, including several new smaller subsequent financial authorities that require high-end security. The infrastructural development in the financial sector is higher in the budding economies, such as India & China. The market will thus possibly encounter with higher growth opportunities in these markets. Other than financial institutions, the bulletproof security glass market is also finding its growing importance in the defense industry. Regions that are highly vulnerable to terrorist attacks such as Israel, Iraq and Syria, have been witnessing surging demand from automotive as well as building construction end-use sectors. Increasing demand for bulletproof vehicles from military and defense installations and important buildings has been a key driver for the regional market growth. Various regions across the globe have laws that prohibit the use of bulletproof security glass. Philadelphia has attempted to enact laws prohibiting the use of bulletproof security glass in the infrastructure of certain businesses, owing to illegal functioning of restaurants as bars, and illegal supply of liquor, both of which attract large crowds that may prove to be a public nuisance. Further, manufacturers operating in developing regions do not seem to meet the international quality standards primarily owing to insufficient R&D investment, which ultimately affects the export activities. Duratuf Glass Industries (P) Ltd.